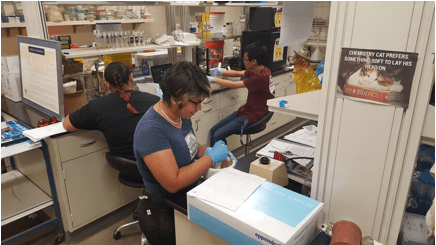 Student Researcher, Karen Ramirez had a summer research internship with Dr. Antonio Lara, in the Chemistry department in Las Cruces, New Mexico. Dr. Lara’s presentation at CSUCI’s Water is Life/Agua es Vida (guest lecture Spring 2016, sponsored by Chicana/o Studies and Chemistry through a CIS grant), opened the door for Ramirez to have the opportunity to work in Dr. Lara’s lab in New Mexico State University. After the speaker series Dr. Luna (Chicano/a Studies) helped with finding funding for Ramirez’s trip. Ramirez received grants through LSAMP awarded by Cindy Wyels and a SRCS grant awarded by Sean Kelly and assisted by Dave Daniels. She also received grants from NMSU Chemistry/Biochemistry department and from the U.S Department of Agriculture. In the Four Corners area, heavy metals, especially uranium, have contaminated water sources in the Navajo Nation. Dr. Lara’s lab examines the use of ceramic dirt pellets to absorb uranium from these contaminated water sources. Ramirez’s project is specifically on the slow dehydration of Gallup, NM clay pellets and the robustness of these pellets. She will be presenting at SACNAS 2016 alongside one of her researchers Moticha Yellowman. Ramirez is planning to graduate Spring 2017 and head straight to graduate school. Through this research she gets to present and is able to get the word out about communities that are being effected by environmental issues. Ramirez was taught to use analytical chemistry techniques through this experience and learned how to analyze samples of contaminated water that was over the EPA limit of uranium. This research is essential to New Mexico and the Navajo Nation to monitor and have concrete data on the effects of consuming uranium. Dr. Lara’s lab is planning to make this technology available to the public to purify their own water due to lack of in house plumbing in these areas.